Very bad example of Tabula in a different theme compared with the original, Tabula 4.1.0 WIP. Dislike the 50 shades of gray tone of Tabula’s theme? 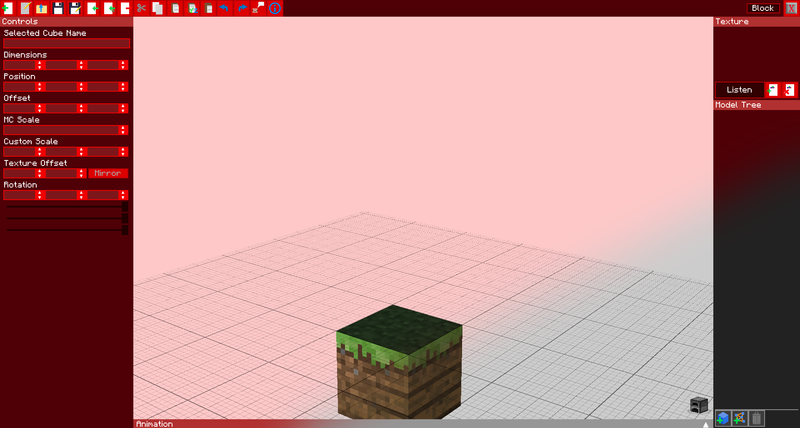 Don’t like the Minecraft Planks block in the middle of workspace and would like another block? Well I’m actually looking for people to help make themes for Tabula. Unfortunately in the mod there is no Theme selector as of yet, and the animation window hasn’t been done yet, but what I can give you is an early WIP build of 4.1.0. In 4.1.0-beta1 (which will need iChunUtil 4.1.3-beta1), when you start up Minecraft with it installed, a new JSON file will be generated in the /mods/tabula/themes/ folder called default.json. Edit this file to your liking, leave the Tabula window and reenter and your theme should automatically be applied unless you did something wrong with the theme file. The number ranges in the JSON file are in RGB format, 0 to 255. When you are satisfied with your theme, drop a comment in this post with a link to your Theme (on a text hosting site or something, screenshot optional) and I’ll come gather them later. Should I find enough suitable themes, I’ll package it up for the 4.1.0 and add a selector in-game as well. I know, i just kinda made them and wanted to post somewhere. iChun, will you ever have time to update the portal gun mod to 1.7 and fix the Seethrough portals, lasers and the emancipation grill? So, do I just break things? And also does it automatically send data back? Do you want anymore, or should i only submit 1 Theme? Can you update this (and PortalGun and GravityGun and all your other mods) to 1.8? And yes, Forge 1.8 is out. when you enter the forge page, scroll down just a tad and you will see the link to the 1.8 downloads. I noticed in both of my previous ones, there’s no difference between the title bar and the rest of the window.